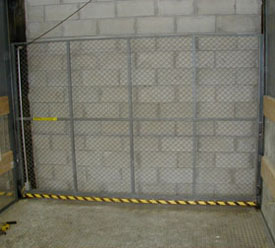 Trico offers both manual and automatic Vertical Rise Gates. These gates are counterweighted and contain guide shoes, chains, chain rods, cushioned edges, and guide rails. TRICO also offers a slim line infra red safety edge which is located on each side of the vertical rise gate. The way vertical rise freight elevator gates are constructed, and the quality of all their parts, can make a big difference in their stability and long term functionality. TRICO supplies some of the best vertical rise gates available in the industry today. We only choose products that meet our high standards including quality products, made of sturdy construction. Single Panel Gate - Use a single panel gate when there is sufficient height in the hoistway. Two Panel Gate - Use a two panel gate when you have insufficient height in the hoistway. To order your vertical rise gates for freight elevators, contact TRICO at (718) 349-6565, download our brochure, or e-mail us at orders@freightelevatordoors.com. Our knowledgeable sales professionals are standing by ready to assist you with any questions you may have concerning vertical rise gates, freight elevator gates, or any of our other products.